Mimaki has announced today the launch of the CJV300 series - its new print & cut flagship that is the first of a series of product unveilings as it exhibits at shows throughout the autumn. The CJV300 will stage its European premiere at Viscom Paris 2014 which opens on 9th September with the new machine sitting alongside a vast portfolio of other Mimaki products on stand D60. The CJV300 is an integrated print and cut machine, available in 1.3 and 1.6m widths, giving simultaneous printing and cutting operations with best-in-class print speeds of up to 105.9m² per hour. Its two newly developed staggered print-heads deliver beautiful, high-resolution printing whilst continuous registration mark detection enables the uninterrupted cutting of an entire roll of media. Additionally, the registration marks produced on the CJV300 are zero-margin, reducing costly media consumption. "The high speed of the new Mimaki CJV300 is going to set a precedent for integrated printer/cutters," explains John de la Roche, national sales manager - sign & graphics for Mimaki's UK and Irish distributor, Hybrid Services. "It's an exciting time for Mimaki customers and the CJV300 will give the ultimate print and cut solution for producing items such as stickers and labels." Coinciding with the launch of the CJV300 comes news of the availability of the eagerly awaited SS21 silver ink, as Mike Horsten, General Manager Marketing EMEA for Mimaki Europe explains; "2014 has been a big year for new products at Mimaki, but the year is not over yet, as visitors to our stand at Viscom will see. We are especially excited to be offering a new silver ink along with a brand-new printer to bring high value-added printing to manufacturers in the sticker, labelling, and packaging print industries. This complements the SS21 Orange and Light Black inks introduced earlier this year and makes it possible for users to create metallic images in no less than 648 different colours with a silver underlay." The SS21 silver ink brightness is 1.67 times greater than that of conventional silver inks, for stunning mirror effect results. Compatible with all printers using SS21 inks, the new solvent silver ink will give print companies the opportunity to greatly add value to their output and print dazzling finishes. In addition to the new product presentations at Viscom, Mimaki has heralded two further additions to the Mimaki sign & graphics family being showcased at Viscom Italy in October; the Mimaki JV150 inkjet printer and its integrated counterpart, the CJV150. 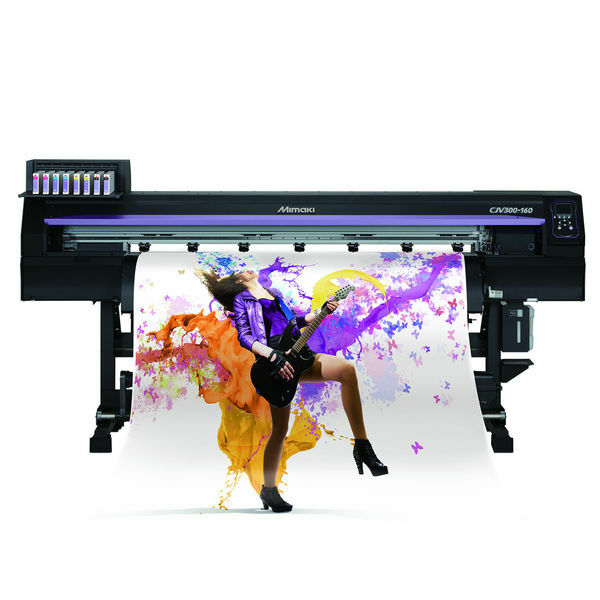 With print speeds of up to 56.2m² per hour, the Mimaki CJV150 and JV150 will be available commercially in spring 2015, delivering entry-level options with the stunning print quality and reliability associated with all Mimaki products.